My Favorite Cute Bistro Patio Furniture Sets! My Top Favorite Lovely Outdoor Bistro Sets! There is nothing more pleasant than having a nice breakfast outdoors with the family! There is something so refreshing and so uplifting about spending time outdoors and breathing fresh air! When I saw these cute bistro patio furniture sets I went crazy! They make awesome gift ideas to any new home owner or newlyweds! The cute bistro table sets for backyard from here are perfect for a relaxing day outdoors! You are going to find cute and affordable patio bistro sets for two, three, four and even six or seven people! Grab a nice cup of coffee or tea, your favorite book or magazine and head outdoors to your new cute bistro set! *How cute is this outdoor dining set for 4 people in the picture above? Perfect for a wonderful meal outdoors with the family! It’s also very comfortable to use! It is made from cast aluminum and should stand the test of time! 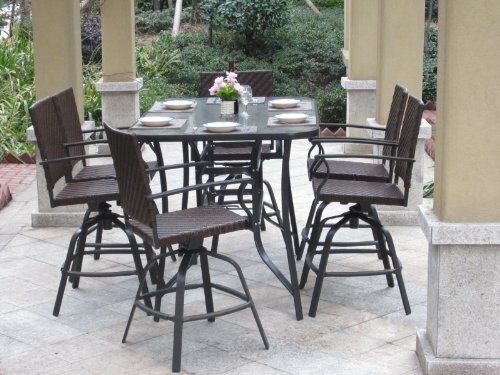 Having a fun outdoor dining set like that in your home makes you feel like you are on a vacation every day! These are also perfect for playing fun board games outdoors! When I was a child my family and I would play games every afternoon on our backyard. It is such a nice way to spend some family time together! Lovely 3 Piece Bistro Patio Furniture Set! If you are looking for the cutest and most affordable outdoor bistro sets for your patio area I think you are going to like this one! 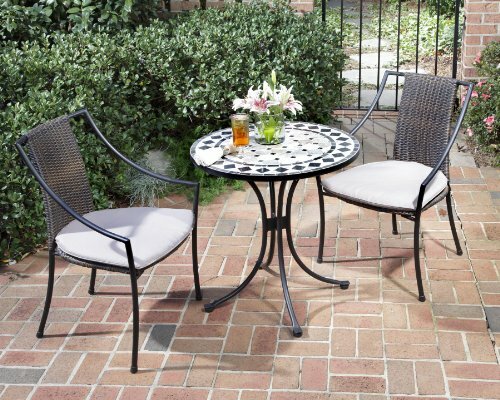 Cute, affordable, lightweight and weather-resistant iron bistro patio furniture set for two people! Great gift idea for newlyweds or the elderly! 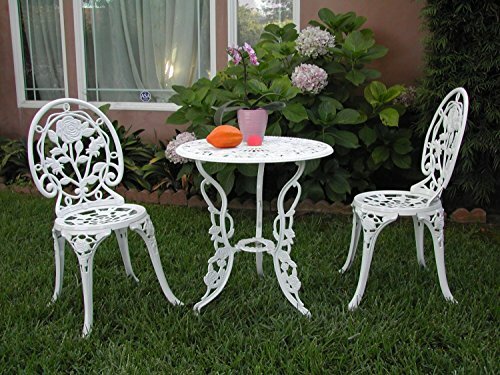 What a lovely and extremely affordable 3-piece outdoor white bistro set! Made of cast aluminum with a beautiful white finish! You can have it on your porch, garden or on your front veranda. Great and Practical Outdoor Seating Patio Furniture! 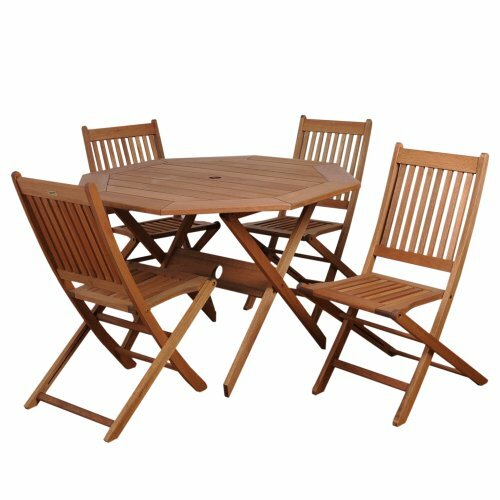 What a lovely folding outdoor wooden bistro set! What a pleasant way to spend a relaxing afternoon with friends and family playing cards or just enjoying nature! It is also very practical and portable! Wonderful gift idea for the new home owners in the family! Cute Floral Design 3-piece Outdoor Bistro Set! 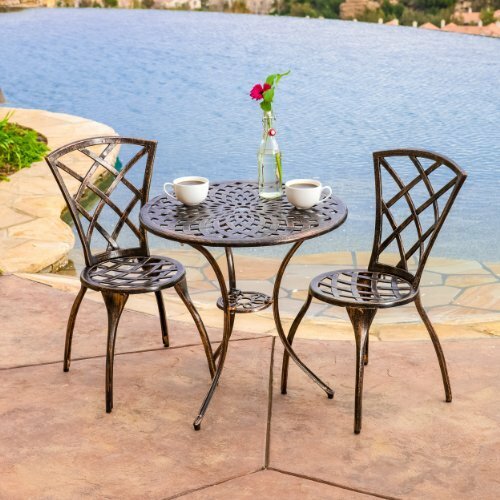 This is one of the cutest patio bistro sets around, don’t you think? It’s a fun, cute and affordable floral bistro set! 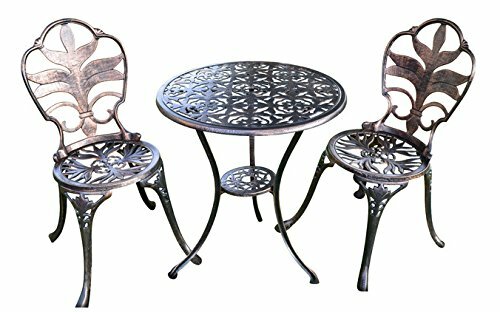 *Lovely Antiqued Bronze Garden Bistro Set with Stylish Leaf Motif Design! 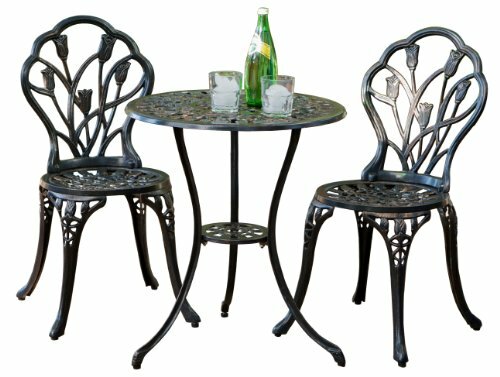 How cute and very unique is this 3-piece garden bistro set with a fun leaf motif? I also LOVE this gorgeous ‘antiqued bronze finish’! The size is perfect for a small patio or backyard as well! This is a very cute and very affordable 3-piece bistro set! You will get the table and the two cast aluminum chairs. Great gift idea for a new home owner! This bistro set is just perfect for a small patio. 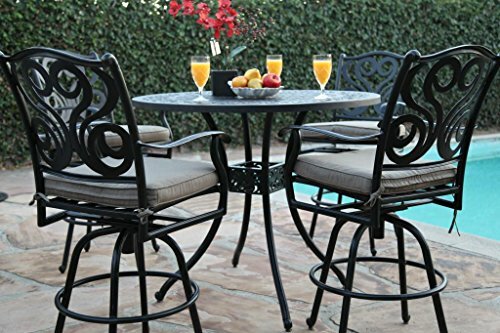 Elegant Outdoor Patio Furniture: 5 Piece Bistro Set! If you are looking for a fancy bistro set for your backyard, this might be the one for you. 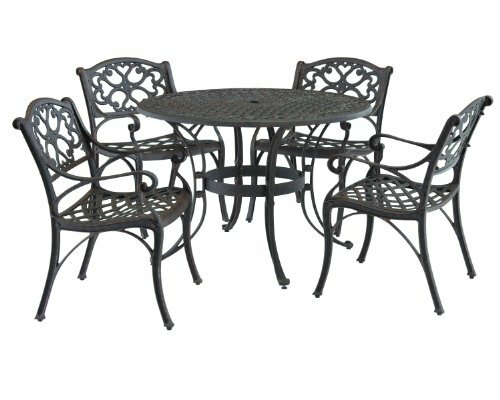 This is a very beautiful and elegant cast aluminum outdoor patio furniture 5-piece bistro set! Perfect bistro set to have by the pool! What a wonderful way to spend a relaxing afternoon outdoors! This is a gorgeous and very fancy-looking 7-piece outdoor patio dining set with comfy wicker swivel chairs! Everyone loves the nice swivel chairs! They are not only very comfy, but also very sturdy. The size is perfect for any medium-size to large patio areas. 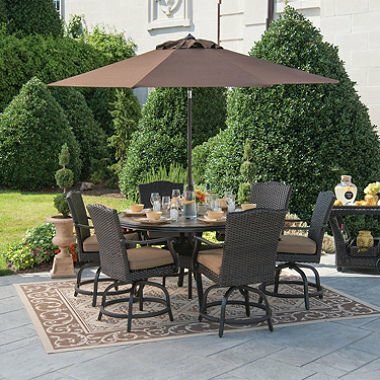 Here is one of my favorite 7-piece fancy outdoor dining-sets with sunbrella and fancy swivel chairs with gorgeous mocha color cushions. It will just make you and your family spend more and more time outdoor this summer! This set is too beautiful for you not to enjoy! This is the complete deal and will improve any patio space you might have. A friend of ours has two of these in his backyard and he always has nice Sunday brunches and barbecues with his large family outside. Sunday brunch is always on from now on!